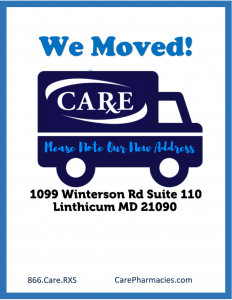 CARE Pharmacies is pleased to announce that we have moved to our new corporate office, located at 1099 Winterson Rd, Suite 110, Linthicum, MD 21090. For mail deliveries, please be sure to update your records to our new address. For questions related to the move, please feel free to contact us here and we will be in touch as soon as possible.